Located in London the goal of the National Portrait Gallery is to bring understanding through portraiture of the women and men important to British history and culture and bring appreciation of the art in all media. Visitors to the Gallery will enjoy the portraits and exhibitions that examine the history and culture of Britain’s most important people. The National Portrait Gallery was established in 1856 by a committee of Trustees including Lord Ellesmere. He offered the Chandos portrait of Shakespeare as the inaugural picture of the Gallery’s collection. The first thirteen years the Gallery was in existence it was located at twenty-nine Great George Street, Westminster. Over the years the Gallery had to be moved several times due to various circumstances until it arrived at its current location. The Gallery was closed in 1915 to protect it from air attacks during World War I and used as a refuge for military and civilians in 1917 when London was bombed. It was reopened in 1920 and had its first visit from a school in 1921. The gallery was hit by a bombing during World War II and several of the portraits were moved. The Gallery began accepting portraits of living people in 1969. During the years 1980 to 1989 the Gallery acquired buildings on Orange Street and began moving the Gallery into them. The buildings were remodeled and refurbished multiple time through the years. In 1996 the main collection was beginning to be digitized and in 1999 the photo and archive collections were also digitized. The National Portrait Gallery celebrated it is one-hundred-and-fifty-year anniversary in 2006 with the publication of a stamp set. 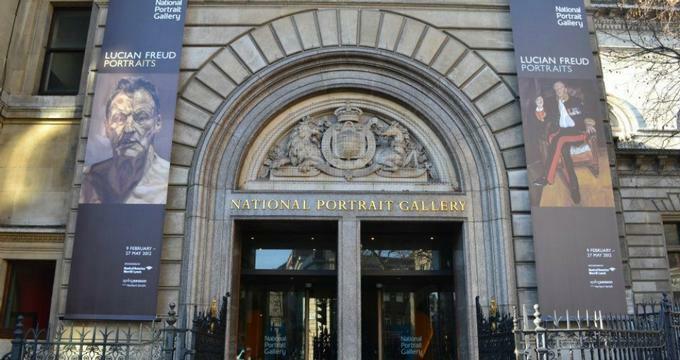 The National Portrait gallery is home to over two-hundred thousand portraits chronicling the important people of Britain’s history beginning with the sixteenth century to modern day. A diverse mixture of mediums including miniatures, negatives, drawings, paintings, photos, sculptures, prints and more have been used to capture the people represented in the Gallery. Primary Collection- This exhibition consists of over eleven thousand portraits, and four thousand of these are sculptures, miniatures, and paintings, but only sixty percent are displayed with regularity. There are also seven thousand paper works that are photosensitive which are displayed on a rotation of around three hundred works a year. This helps limit light exposure and reduces fading and deterioration. Photographs- This collection is made up of over two hundred and fifty thousand original photos. One hundred and thirty of these are the original negatives. The photos in this collection are dated starting in the 1840s and lead up to modern day. The photo collection is separated into two parts: a primary and secondary collection of photos. The photography collection consists of photographic work from a wide variety of photographers. Prints and Drawings- The reference collection can be found in the Heinz Archive and Library and consists of over eighty thousand portraits of both important and more obscure British figures throughout history. Most of the portraits here are prints, but drawings, caricatures, miniatures, paintings, silhouettes, medallions and other mediums are also housed here. Heinz Archive and Library- The Archive and Gallery’s goal is to be the primary center for research and study of portraiture. It contains three collections: Library, Archive, and Reference portrait collections. The Library and Archive collections are housed in a center that is accessible to the public. The center is meant for the study of portrait works and maintained by NPG. Several educational opportunities are offered through NPG. Adults- The NPG regularly hosts lectures, talks, evening events and workshops f0r adults. Schools and Colleges- Field trips to the NPG are curriculum driven and activities for all ages are provided. Families- NPG offer free resources and activities for families to enjoy together. These activities are usually hand-on such as animation, painting, and drawing. Young People- NPG offers free programs for young people ages fourteen to twenty-one. Some of these include practical workshops led by local artists such as painting, photography, drawing, sculpture, film, music, fashion, dance, poetry, and drama. NPG hosts a variety of temporary exhibitions throughout the year. The following are some that are available. Cezanne Portraits- This exhibition combines more than fifty portraits done by Cezanne from collections all over the world. It provides a unique perspective on the aspect central to his work, featuring special thematic and pictorial qualities of his portraiture such as his different versions of a subject, and his love of creating complementary pairs. Michael Jackson on the Wall- This exhibition examines the influence Michael Jackson has had on chief names in modern art covering many generations of artists spanning all media.